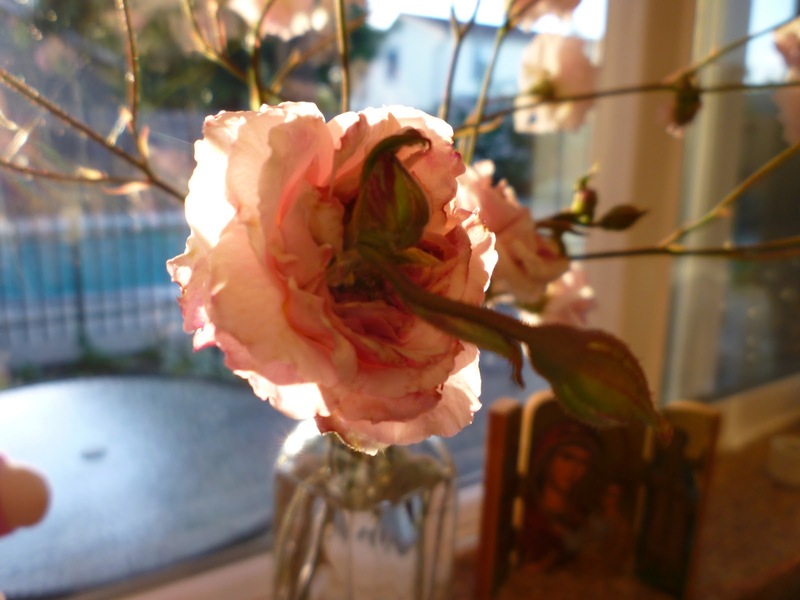 This evening I brought in a few stems of Cécile Brunner roses to decorate my windowsill. I notice that a couple of the roses have buds sprouting from the center of the flower, and I don’t think I’ve seen that phenomenon before. Actually, this one seems to have two buds coming out. My godmother is collecting rose petals for throwing at some point in her daughter’s upcoming wedding. 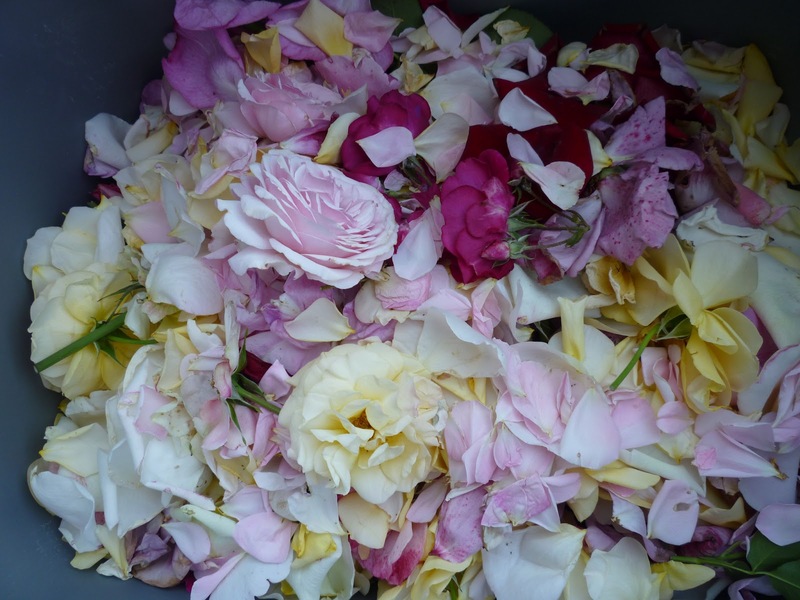 As I have to be out of town and will miss the event, it made me happy to be able to contribute some petals, which I acquired by picking spent blooms from another friend’s prodigiously blooming bushes. It took me about a half hour to collect a couple of grocery bags full, and another hour to sift through and take out insects and stems. I set them to drying in an ice chest and a big tub, and while they sat in the sun the remainder of bugs seem to have departed. A few times a day I am stirring them. 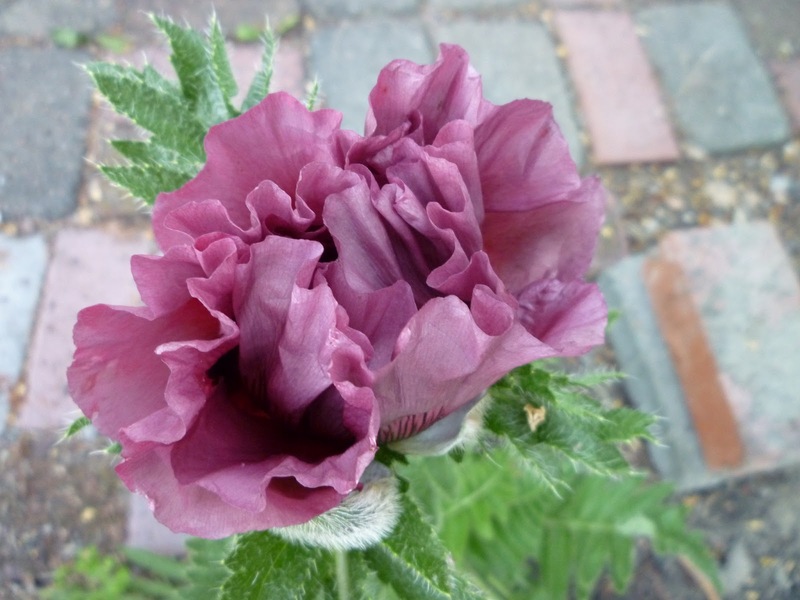 The Patty’s Plum poppy that Pearl gave me years ago has three blooms this year! I may have already put up a photo of one. But this third flower is the prettiest yet. The plants stand about a yard tall. 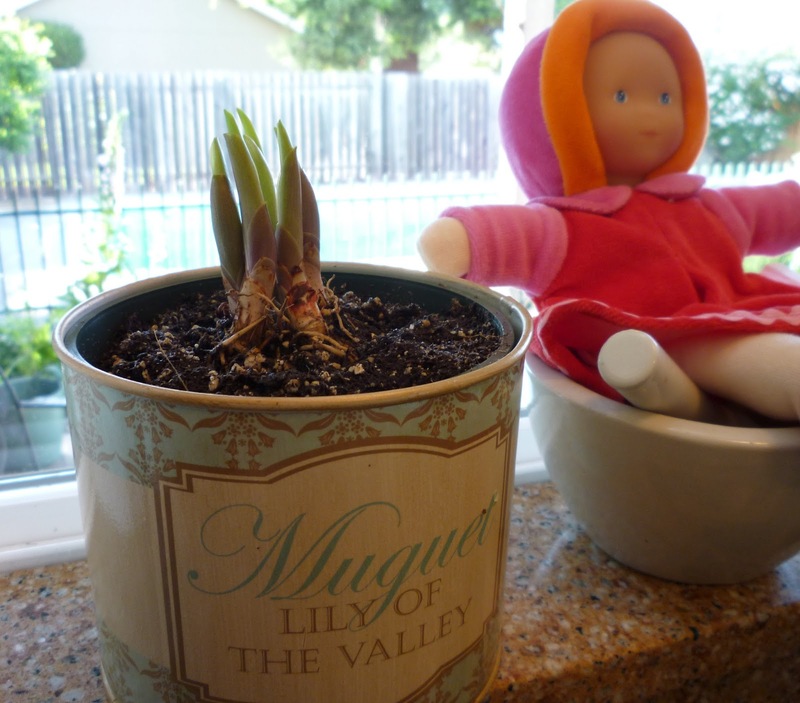 Kate sent me a pot of Lily of the Valley bulbs for Mother’s Day. Less than a week later they are already a couple of inches high. I have Miss Grenadine keeping me company on the windowsill above the sink these days; she can help keep an eye on the shoots. All over the garden I’ ve been digging holes and putting in various other flowers: zinnias, mimulus, mixed colors of California poppies, African daisies, lobelia, morning glory. In a few weeks I should have more flowery pictures to show. I’ve been putting my tools away every night and have swept the patio. Everything is ready for you to come and visit my garden!